January 19th, 2017, Charlottetown – A trio of Island short track speed skaters opened their 2017 competitive campaigns in strong fashion at a Quebec provincial circuit meet in Chicoutimi, Quebec, recently. Carly Connell, along with Charlottetown siblings Andrew and Peter McQuaid, were competing in Quebec as part of their preparations for a return trip to the Canadian Junior Selections #2 event set for Trois-Rivières, Quebec in March. 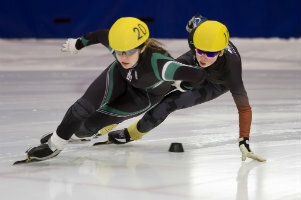 Carly Connell (left) took 6th place at a recent Quebec provincial circuit short track speed skating competition in Chicoutimi, QC. Photo courtesy of Jim Crawford. Connell, competing in the top female group, came away with a 6th place overall finish, which included a seasonal best in her 1000 metre distance. Connell also earned qualifying times to ensure her return the Canadian Jr. selections event. Andrew McQuaid, skating in Group 3 for males, took top spot among the 18 competitors in his group after winning all nine of his races, including a dramatic comeback win after a fall in the 1500 metre final. Peter McQuaid nabbed 8th place among 19 skaters in Group 2 for males. The strong finish was despite a penalty in the preliminary round of his 1000 metre event, as McQuaid posted some of his best times of the season in the 500m and 1000m finals. Island speed skaters are now looking ahead to an upcoming meet in Hampton, N.B. and to the Atlantic Canadian Short Track Championships, slated for Dieppe, N.B. on February 4th and 5th. Speed Skate PEI says it expects more than thirty Island skaters to compete in Dieppe. For full competition results and more information about Speed Skate PEI programs, visit www.speedskatepei.com.